No American president has enjoyed as intimate a relationship with the soldiers in his army as did the man they called "Father Abraham." 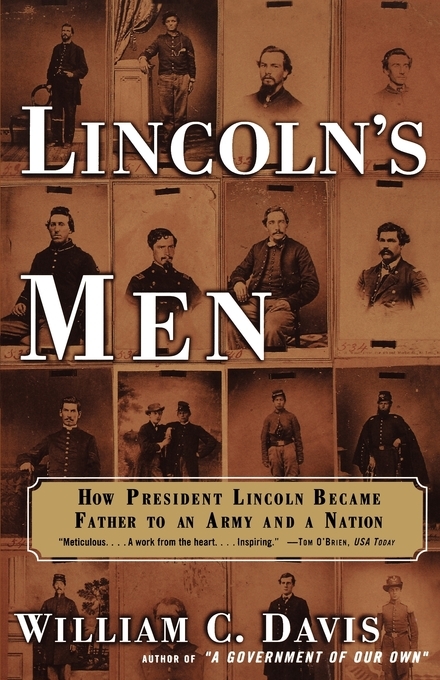 In Lincoln's Men, historian William C. Davis draws on thousands of unpublished letters and diaries -- the voices of the volunteers -- to tell the hidden story of how a new and untested president became "Father" throughout both the army and the North as a whole. How did Lincoln inspire the faith and courage of so many shattered men, as they wandered the inferno of Shiloh or were entrenched in the siege of Vicksburg? Why did soldiers visiting Washington feel free to stroll into the White House as if it were their own home? In this through and authoritative work, Davis removes layers of mythmaking to recapture the real moods and feelings of an army facing one of history's bloodiest conflicts. Lincoln's Men casts a new light on our most famous president and on America's revolution -- on our country's father and its rebirth. Tom O'Brien USA Today Meticulous....A work from the heart....Inspiring. Robert Taylor The Boston Globe Amid a continuing avalanche of books about the Civil War, William C. Davis's Lincoln's Men is in a class of its own. James I. Robertson, Jr. Richmond Times-Dispatch Dramatic, moving, informative, human to the core, this study is historical reporting at its best. James P. Pinkerton Los Angeles Times Stirring. William Safire The New York Times [Lincoln's Men] will be a surprise best seller. Ed Malles The Orlando Sentinel An excellent book....Davis' talent for the details that define the whole is used to great advantage here, and his ability to craft the evidence to support his premise makes the book all the more convincing. Richard R. Roberts The Indianapolis Star In William C. Davis' Lincoln's Men, Abraham Lincoln rises above the sniping of revisionist historians and retains the towering image that makes him synonymous with freedom and the potential for greatness in the common man....[A] vivid portrayal of how soldiers felt about the soft-spoken "father". Bill McLain San Antonio Express-News Lincoln becomes a stronger, larger military leader through this book's exposition and research. Davis has written a much-needed chapter of Civil War and military history. Jonathan Yardley The Washington Post Book World What matters about Lincoln's Men is that it is an overview of an always interesting subject. Tara Croft Chicago Magazine Using letters written by soldiers during the Civil War, Davis offers compelling evidence of the compassion Illinois's favorite son had for the U.S. soldiers.